“Remote patient monitoring is essentially going to put a rocket launcher on telemedicine,” says Waqaas Al-Siddiq, due to years of experimentation in healthcare technology with Artificial Intelligence (AI) and the lowering of costs. He credits the lowered cost for chips and connectivity, along with the proliferation of the Internet of Things (IoT), with creating a cross-pollination process – where technological advances in one area drive progress in another by clearing barriers to accessible, intelligent medicine. Al-Siddiq is the CEO of Biotricity, a remote patient monitoring company, and as such, is uniquely qualified to weigh in on emerging trends in healthcare and AI technology. Biotricity was created to fill a growing need for remote, proactive health monitoring. The company’s real-time, high-precision mobile telemetry solution enhances a physician’s ability to monitor a patient’s condition while enabling the patient to take an active role in managing their condition. When there is a possible issue, an alert is sent to a call center. If it’s an emergency, Biotricity and other appropriate personnel can respond accordingly. Having started with the diagnostic cardiology market, the company is now planning to apply its proprietary remote monitoring platform across a spectrum of connected health applications, including fetal, sleep apnea, and COPD monitoring. “We’ve gotten to a point where some of those experiments have ultimately failed miserably, and some of them have been very successful. The successful ones are now going to move on to the next stage,” he said. Sloan-Kettering is using IBM’s Watson for cancer screening, but the process is less like a true screening and more like a series of suggestions. After feeding historical data into Watson, doctors work with the question answering computer system to understand the diagnostic process. 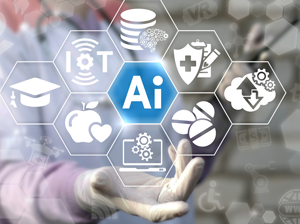 Although he sees significant expansions in the use of Artificial Intelligence within the biggest healthcare organizations, Al-Siddiq doesn’t expect this trend to be widely accessible to the general public in 2018 because clinical decisions can be “a very complicated area.” According to Al-Siddiq, true use of AI is “going to be the last piece of the puzzle in healthcare transformation because of the regulations.” He also insists that while patients may be comfortable with data collection and having input from AI, they want to be reassured that a human doctor is still involved. Al-Siddiq insists that an increase in partnerships among hospitals, specialists, and technology providers will expand the use of AI for diagnosis and treatment in 2018. A new electro-physiologist hired just out of school can then be paired with the AI, expanding the influence of the top doctor that did the training. “In 2018 we’re going to see a lot more of these mash-ups,” says Al-Siddiq. This year, some organizations will also be able to build on past developments and move beyond experimentation into practical implementation. Bluetooth-enabled stethoscopes and glucometers that can record and store blood glucose levels and heart rates in the Cloud are now available and networks like AT&T and Verizon are getting more devices connected. Reimbursement is another area where innovation can run into complications, but the Centers for Medicare and Medicaid Services (CMS) have already approved telemedicine billing, so Al-Siddiq expects this won’t be an issue for long. “In a lot of states, from a physician perspective, it makes no difference to them whether they’re seeing the patient remotely or physically – they make the same amount of money,” he argues.